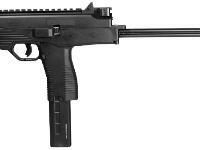 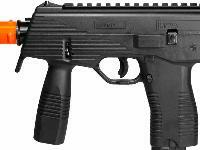 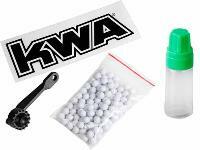 The KWA KMP9 NS2 Gas Blowback is an awesome submachine gun with serious attitude. 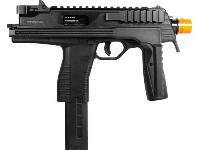 This gun is highly sought after by airgunners for its superior reliability and uncanny rapid fire rate. 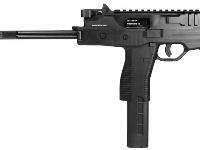 The gun features semi/fully automatic firing, a 48 Rd magazine, and a shot velocity of 380 fps (using .20g BBs).The revolutionary NS2 gas blowback feature on this submachine gun adds outstanding realism to the shooting experience. 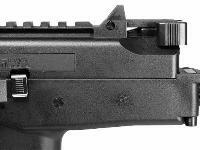 The KMP9 also has a picatinny rail interface system on the top and side for mounting optional scopes and flashlights. 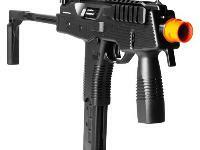 Airsoft enthusiasts, do not miss this gun! 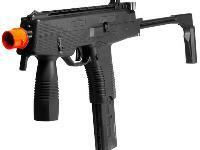 Red dot sight not included. 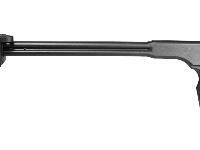 Gun comes with Silicon Oil, Sample package of BBs, and a Hop-up Adjustment Tool.